For a professional candy bar look... use the best candy bar wrapper foil! 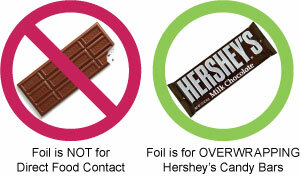 Paper backed foil is very easy to wrap Hershey's 1.55 oz Milk Chocolate, Hershey's 1.45 oz with Almonds, Hershey's 1.55 oz Cookies n Cream, Nestle Crunch candy bars, or any similarly sized candy bar. Pre-cut candy bar over wrapping diy professional grade foil.